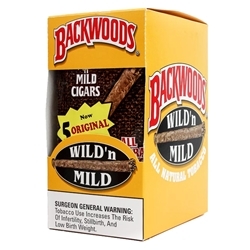 Backwoods Wild & Mild Cigars, is a cigarillo style cigar wrapped in an all-natural Connecticut broadleaf, fused together with 100% natural tobaccos. The Backwoods Wild & Mild are designed with a tapered body, unfinished head and frayed at the end. Each of these cigars offers a mild and sweet flavors producing a relaxing aromatic fragrance. The Backwoods Wild & Mild cigars are machine made with a perfect balance of smooth flavors of classic tobacco. Each unit contains 8 convenient packs of 5 cigars.